"Visions of Earth: Seeing with the Minds' Eye"
Tall grass glistens in warm sunlight and wind gently rustles through distant trees. I hear the sound of robins and sparrows and look up at the azure sky. I take a deep breath and close my eyes. It’s the earth as she is to me: captivating, nurturing, stunning, and seemingly indestructible. I am overwhelmed with love of the light and colors I see in nature. With my camera, I take snap shots of the landscape to reference while I paint. However, my true inspiration comes from what I think of as the “Mind’s Eye”. While I stand in front of a blank canvas, I am not guided by photographs that my eyes see. I am guided by the vibrant images in my mind formed from memories of places visited. The colors, intricacies, and emotions are translated from my mind to my brush. The paintings become my story, and they allow me share how I experience the world. Raw energy and furious color give way to subtle light and technical compositions. 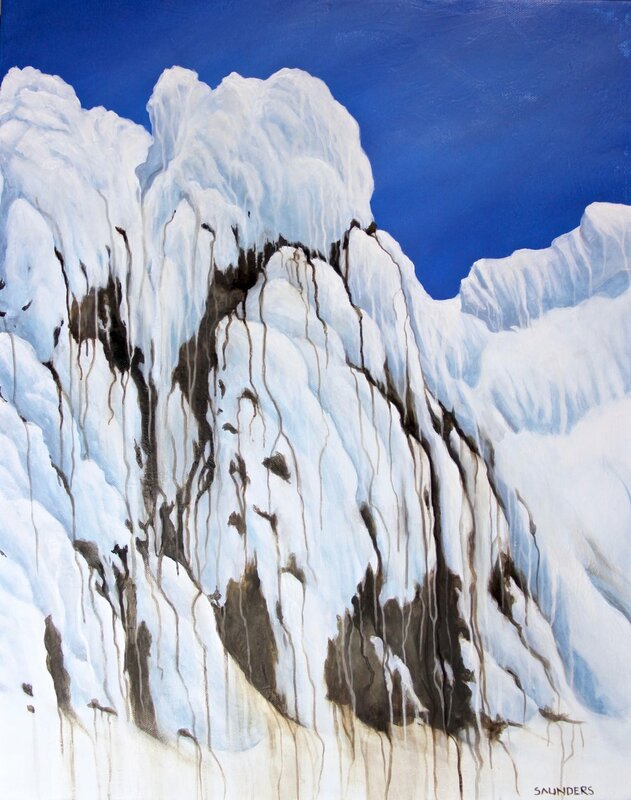 Drippy paint represents the diminishing wild land, reminding the viewer that nothing is permanent. Calculated lines force themselves across the canvas, just as computers and technology have taken over our planet. While I am lucky enough to live in a body that takes me places, and am equipped with a mind that can process nature’s beauty, I am troubled by what my own species has done to a world that has given us so much. My purpose is to illustrate this dilemma and connect with those who share similar thoughts. I look forward to future exploration and continuing to developing the way in which I tell my story. ($950) Oil- 32 x 26 inches. Oregon is my home. I have fallen in love with this place and feel so lucky to live here. There are so many trees and volcanic features that create soft layers of land while fog fades them out. I am constantly overwhelmed by the beauty of the Northwest and want to capture how I feel in a painting. ($1,200) Oil- 32 x 48 inches. We live in a digital world now, whether I like it or not. I am realizing it is influencing me though. I am adding some pixel-like features in some paintings. In this piece, the ground is checkered and not real. Digital and reality, what will be? I will still paint. ($1,450) Oil- 72 x 24 inches. I saw the Columbia Gorge in all her beauty the day I captured the sun poking through the clouds. It was one of those moments where I had to just sit and watch and remember why I am here and what my intentions are. I am grounded and filled with love. Cape Disappointment ($875) Oil- 32 x 26 inches. I visited this beautiful cape and had to photograph the coastal waters crashing into each other, creating a powerful explosion of salt water. I was not disappointed. ($875) Oil- 32 x 26 inches. I have seen a lot of dramatic weather and storms impacting our world the past few years. Climate change scares me and fascinates me. Fire is a hypnotizing and beautiful sight, but the frequency of these fires on the west coast is something out of the ordinary. ($975) Oil- 36 x 30 inches. The night shows a majestic side while the fog moves over the hills. Everything is alive and in constant motion. This is when I feel clear and at peace. Painted on a cold winter day in Oregon, this piece shows the tone of the day and the feeling in the air. I am at peace, undisturbed, and cozy, says the mountain. All is calm. ($325) Oil- 20 x 16 inches. I climbed Mount Hood in the spring and was overwhelmed by the way the snow covered the sharp rocks and features of this volcano. The backdrop of intense blue against the bright white snow was surreal site. It really looked like ice cream! ($1,600) Oil- 48 x 38 inches. Animals and humans have always intermixed, whether they want to or not. However, as animals’ land gets more and more encroached on by humans, they have nowhere to go except in our cities that were once their natural habitat. The beauty in sadness? This is how I feel when I see the bright blue waters of a glacial flow. They are disappearing before our eyes and it tears my heart out to see the earth lay paths for the ice melt of the century. Will they be gone in fifty years? I will do my part for conservation and focus on the beauty of colors that I never knew existed until I saw them. ($825) Oil- 32 x 26 inches. I’m from Wyoming and will always have a connection to the land. It’s often so desolate and quiet that if you set foot somewhere out there it’s as if you know that no other human has ever touched the same spot. The badlands are so full of color and shapes that you can see the millions of years that have passed, right in front of you. This painting is a glimpse into that land that I love so much. ($525) Oil- 28 x 32 inches. In this painting you see more of that pixelated and graphic style with the water. Our glaciers are melting and the digital world is becoming a reality, get ready and enjoy the view. 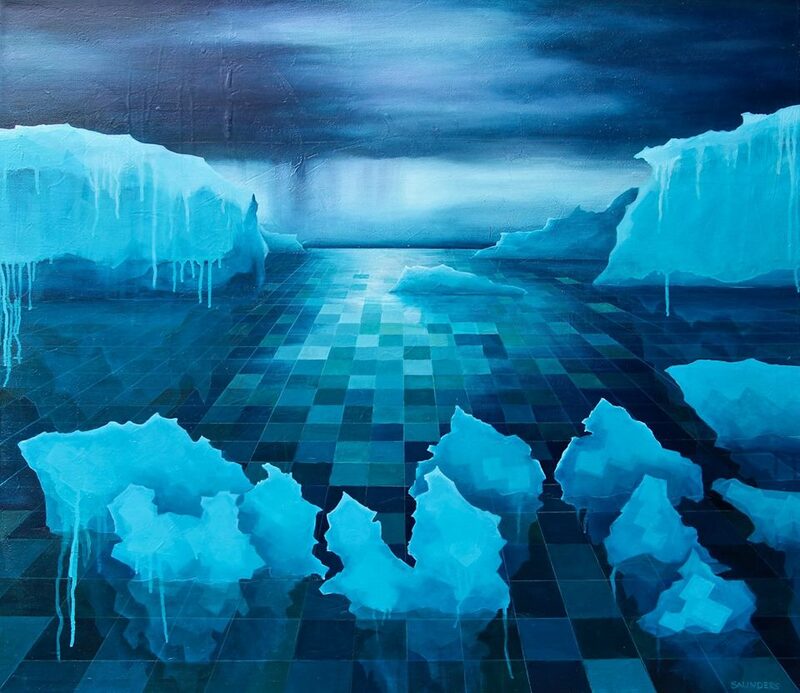 ($1,000) Oil- 32 x 28 inches. This piece is from when I discovered the smoke tree! They are amazing and really look like little puffs of smoke with red and alizerin crimson color. I play with composition and angles with this piece. Rhododendrons, mosses and ferns thrive here in Oregon. The land is so alive and green. We live in a paradise and I really wanted to capture that with this piece. ($550) Oil- Remnants- 30 x 24 inches. Traveling to Glacier National Park was incredible. Incredible because of the stunning landscape but also the realization that these glaciers I was looking at may not be here in five years. Nothing captures me more than this earth we live on. When I stand next to water this blue, it’s as if I have gone out of my body and am seeing myself from the outside in. Are these colors real and will this become only remnants of a beautiful past? This piece is dear to my heart and I will always have a strong connection with it. ($950) Oil- 30 x 48 inches. 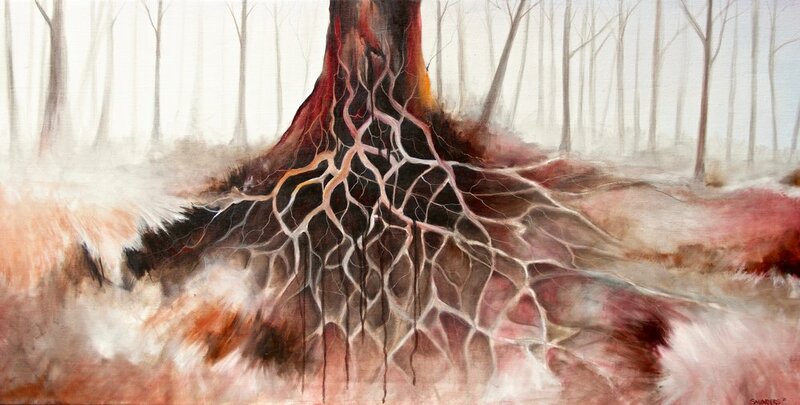 Establishing my life here in Oregon, this piece represents the building of a life and growing roots. 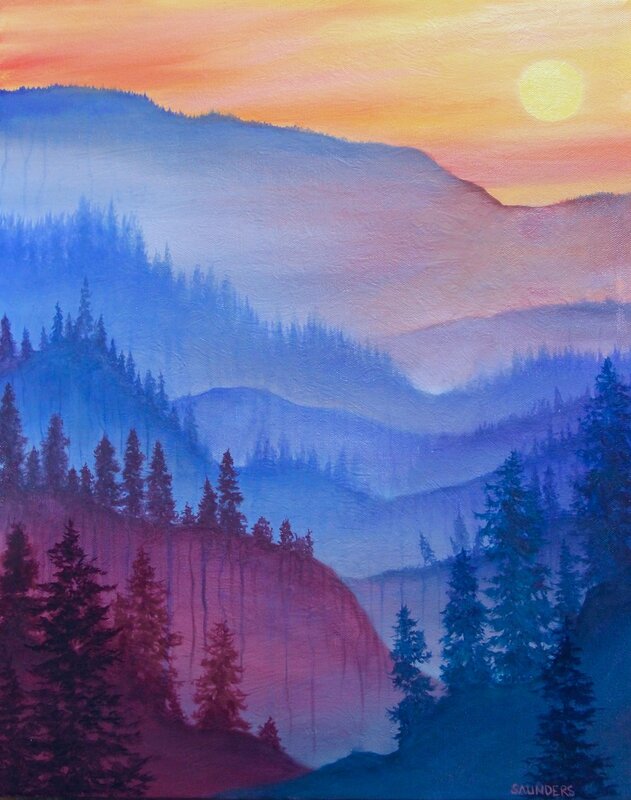 This piece is a rendering of a stunning sunset and atmospheric haze that seemed to go on forever. ($550) Oil- 25 x 20 inches. Smoke makes a landscape of it’s own, covering a forest in a warm haze of white with layers of black trees and blazing red orange fire in the distance. It’s a sign of rejuvenation and terror simultaneously and I find it captivating and mysterious. ($450) Oil- 25 x 20 inches. Unbelievable contrasts of color captured me here. You can’t replicate these colors with paint but I try to show the moment where it got me the most. Stevenson's "Destination Gallery", located in the beautiful Columbia Gorge.